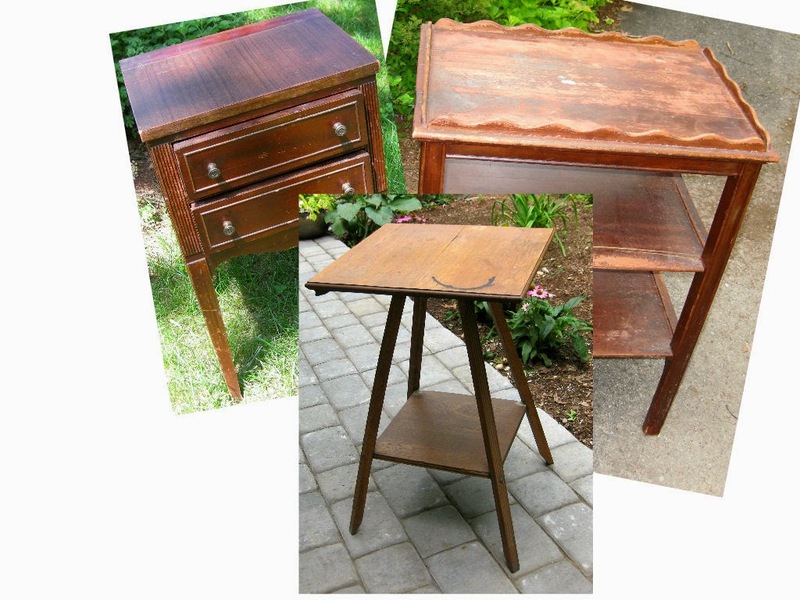 This desk with a hutch top was in good shape and solid wood but can you say "b-o-r-i-n-g?" It is a nice size (not too big) and I knew that some paint and a couple of other new details could revive it. The color is actually much deeper than it shows in the photo - it's HM chalk paint made with Glidden's Smoked Turquoise. 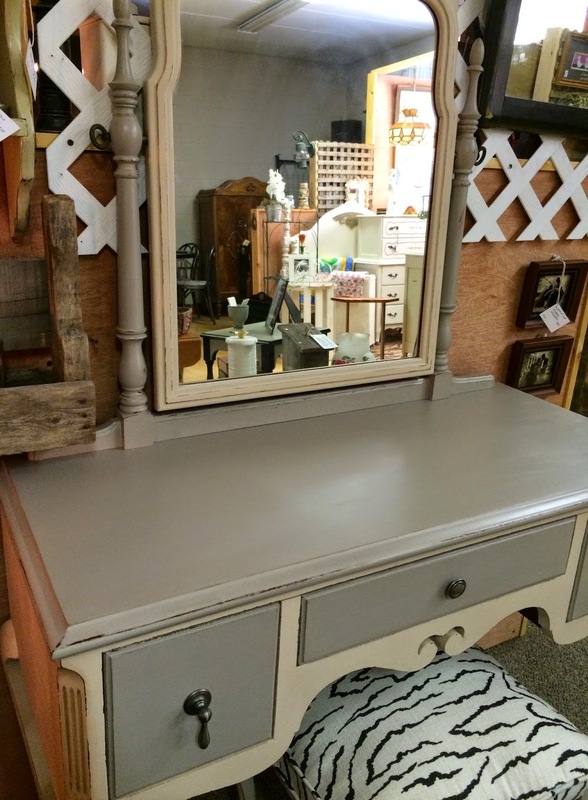 The top of the desk & the back panel were also painted with HM chalk paint made with BM Galveston Gray. It was waxed with Americana Decor's clear wax first, then with Americana Decor's brown wax. The typography on the desk top is courtesy of The Graphics Fairy. I've been on a mission for several months to learn more about a chair I purchased more than a year ago. I bought this in two pieces at a flea market for $20.00 and the girl I bought it from had no idea how it went together - I don't think she even knew it was a chair. Since I was looking for a project, my intention was, of course, to paint it! After I got it home and figured out how the pieces went together, it was obvious that this was no ordinary chair. Before I did any rehab, it might be a good idea to learn more about it. Here's the assembled chair - the seat can be adjusted up or down and the handle at the top of the back swings to the upright position or back down. There are no other moving parts. It does not fold up nor can the seat be flipped up or over. The 1st photo shows the seat in the highest position and the 2nd photo shows the seat in the lowest position. I've contacted a couple of antique dealers who weren't able to tell me anything about it and where is the Antiques Roadshow when you need them?? So, I posted a photo online a couple of days ago and it's generated quite a few views and some interesting suggestions on the chair's history. Check it out if you're curious and leave a comment here (or on Facebook) if you think you know what it is! Guess I won't be painting this one anytime soon! I started cleaning & repairing, then moved on to deciding what color I wanted to use on each. Next thing I knew, I had a patriotic trio. They are not a "set," but they are definitely red, white & blue! Many months ago this vanity, mirror & seat were a gift (found curbside). I've scored a couple of other items that way but this was by far my best curbside "gift!" Structurally, it was in very good condition. The finish was watermarked and the upholstery was a mess but I had plans for it - even though it took me several months to get started. I like to clean up the top of dressers, vanities, etc. when possible and restain. I like the look of the wood top with a painted base but I just wasn't comfortable with the way this one looked after sanding. There were too many watermarks, so I ended up painting. 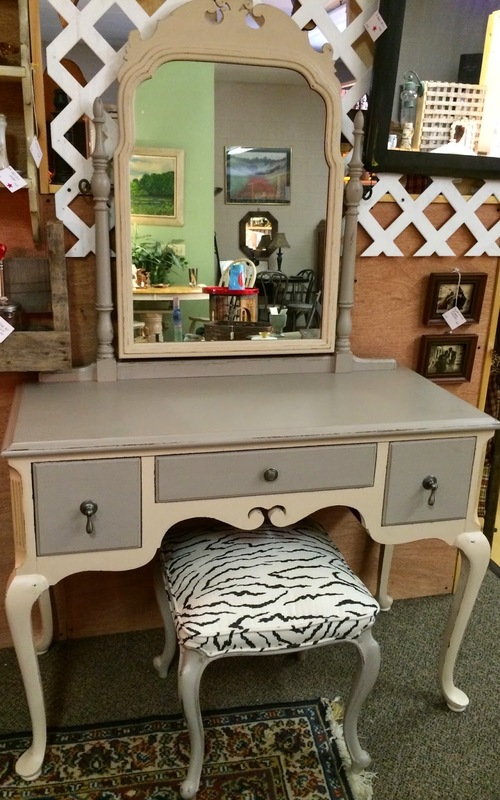 I used HM chalk paint with Behr's King Arthur & My Savvy Sisters Chalk Paint Dust on the vanity. 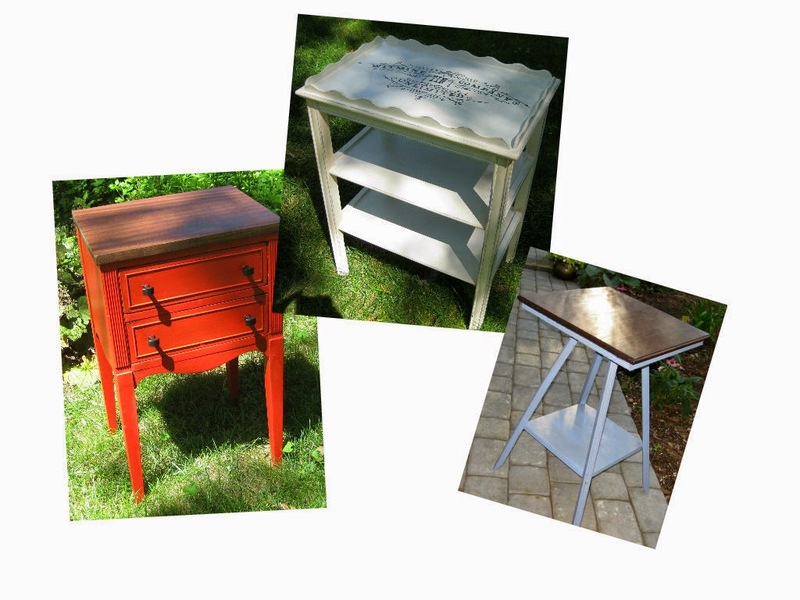 Drawers, mirror & seat were also painted with HM chalk paint using My Savvy Sisters Chalk Paint Dust. Color was a Behr mistint (sorry). For the top of the vanity I used a HM chalk paint mixture (POP + Calcium Carbonate) that I haven't tried before but after doing some research, it sounded like it would be most durable. The entire set was protected with Vax - love this stuff! Can I buy it by the gallon? One piece of the original hardware was missing so I replaced it all with pewter knobs found at Home Depot. I've done upholstery jobs before but that little seat was a beast! The lining in the drawers matches the seat.